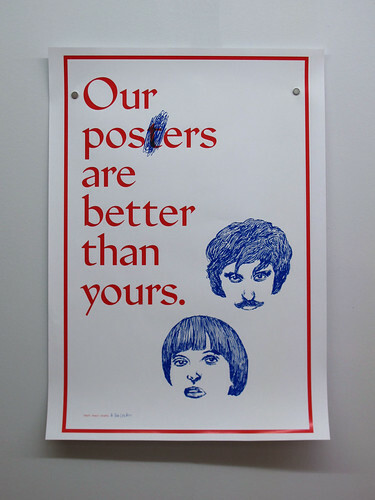 Below: poster by Les Graphiquants. 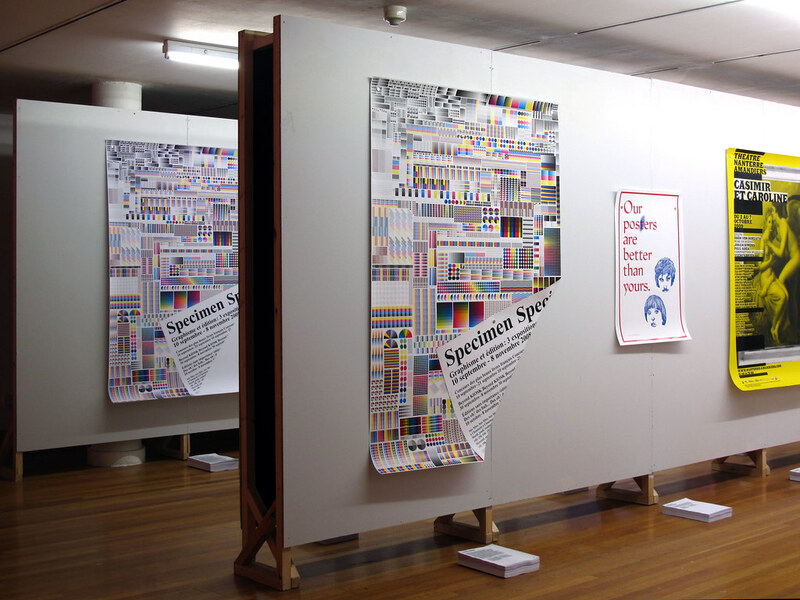 Posed as a dialogue between British and French graphic designers, 21 large-scale posters vied for attention across the quiet Lower Gulbenkian Gallery. Yet, did the British have an unfair advantage? 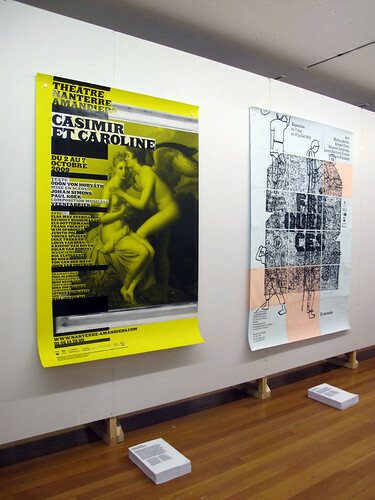 Above: poster by Vincent Perrottet and Anette Lenz. The ten French posters presented were the selection of the International Poster and Graphic Design Festival of Chaumont 2010, the aim of which, according to the director of the festival, Étienne Hervy, was to ‘… help build the value of these posters in their own right,’ as well as to ‘raise awareness, among the public and the clients themselves’ for the posters’ relevance in contemporary graphic design. Chosen from a diverse number of largely commercially commissioned projects, the posters vary from the painterly elegance of Philippe Apeloig’s YSL poster for the Petit Palais, to the chromatic ‘printer marks’ of Fanette Mellier’s double-sided poster / book (below). The posters speak for themselves, although some shout louder than others. The eleven British designs are ‘responses’ to the winning French posters. Invited to respond by curator Sophie Demay, the British designers had the freedom to be more direct and irreverently self-conscious. 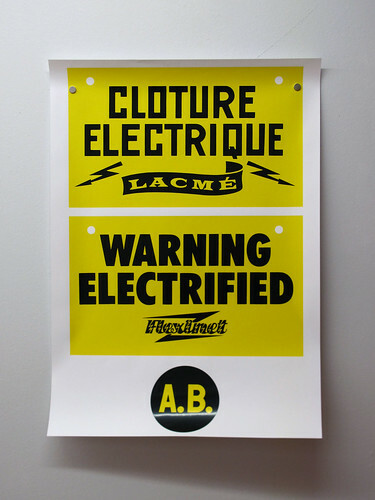 They parody implied British / French cultural divides, such as (below) Stefi Orazi and Bob London’s assertive use of Eric Gill’s Jubilee typeface, or creatively reference the French posters, such as Ray O’Meara’s YSL inspired typeface, Jovial (Duroselle), and Ken Kirton and Louise Naunton Morgan’s ‘hybrid’ reprint of Fanette Mellier’s poster. 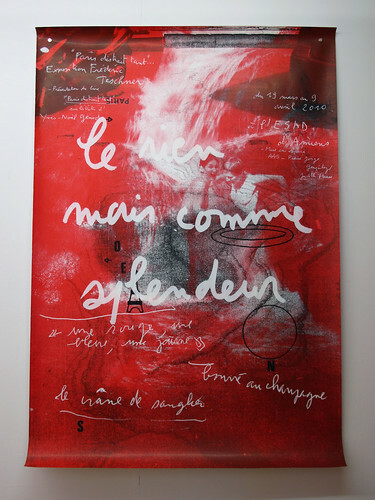 While the French posters herald events or contemplate the status of the contemporary poster, such as within the voluminous folds of Les Graphiquants’ conceptual ‘presences’, the British posters are more cunning, pointed and tongue-in-cheek. Below: poster by Anthony Burrill. 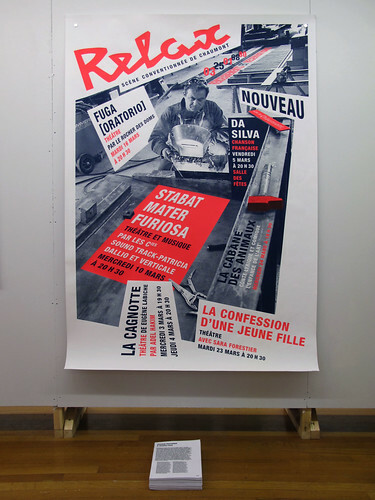 As a democratising influence, curators (and RCA students) Sophie Demay and Clo’e Floirat ‘tunnelled’ the exhibition, mounting the large posters on to two alleyways of opposing boards, in which the French posters and the English counterpart ‘responses’ are alternated. This plays out like a barricaded streetscape, drawing the posters into witty relationships; glimpsed beside, behind, and out of the corner-of-the-eye. 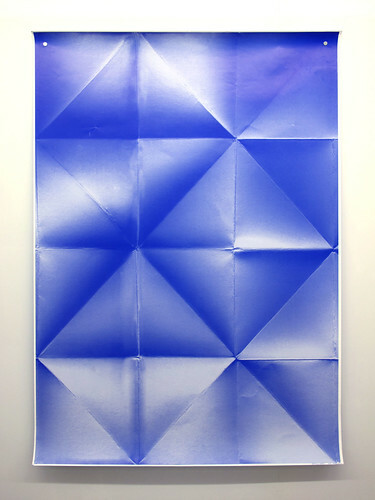 Natalie Ferris is a student in the ‘Critical Writing in Art and Design’ department of the RCA. Special thanks to David Crowley. 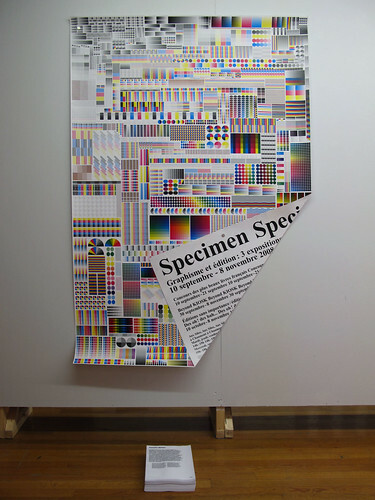 See also ‘Sticks in the mind’, Véronique Vienne’s article about contemporary poster culture in Eye 69. Below: poster by Frédéric Teschner.